Aconcagua 1/10: Thank you PRO Sports Club! Thank you PRO Sports Club! My friends at the PRO Sports Club are promoting my climb by running this image on their club sign boards, providing links on their proclub.com and 2020lifestyles.com websites, and a blurb in the January edition of the club's PRO Pulse magazine. More than an amazing facility, the PRO Sports Club has the world's greatest set of employees. They saved my life and have provided me with the tools and resources to train for world class mountain climbing. Their passion for their clients goes way, way beyond the job. Thank you to all my friends and every member of the staff at PRO. Because of you, I am ready to not only take on the highest mountain in the Western Hemisphere but continue to live my life in the healthiest possible manner. 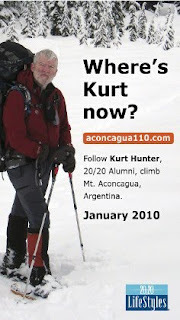 Way to go Kurt.....We are so proud of our famous neighbor!!!!! Awesome photos too....Say Hello to Heidi...oh wait, she's in Europe!